​​ BEAUMONT – The former T1 Building at Lamar Institute of Technology​ (LIT) will soon be replaced by a new $6.1 million Student Success Building. 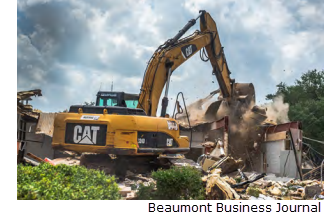 Demolition of the building, located behind Cecil Beeson, began in late June 2018 with an estimated construction completion date set for June 2019. Construction of the Student Success Building will complement renovations on building T-4, which began July 2018. The total project cost, including demolition, is $7.4 million. The building will house Financial Aid, Student Government Association, Advising/Outreach, Student Activities, Career Services, Admissions, The Testing Center, Teaching, and a Learning Center with Online Learning and Adjunct suite.